American Range Inspired by our passion for perfection, renowned for our product innovation and quality. We earnestly feel we have perfected the professional home range. 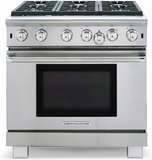 Our residential professional line of gas ranges, French-door wall ovens, and cook-tops are commercial grade. Our professional cooking products have the soul and capability of our commercial ranges bended with luxurious style. To summarize, we have civilized our commercial ranges.